SACRAMENTO (CN) — Storms packing gale-force winds and record-breaking rainfall tore through drought-riddled California again Tuesday, toppling majestic trees, closing major freeways and spiking rivers to heights unseen for a decade. Northern California and parts of Nevada have been inundated by “pineapple express” storms since Saturday, fueled by a meteorological event known as an atmospheric river. The moisture-laden Pacific storms have blanketed the Sierra Nevada with several feet of snow and tumbled over mountain passes with extraordinary wind gusts. A 173 mph gust was recorded over the weekend at Squaw Valley Ski Resort near Lake Tahoe. Blizzard warnings were issued Tuesday for parts of the Sierra, and wind set off several avalanches, causing officials to close traffic on Interstate 80, the main route through the Sierra into Nevada. Forecasters predicted stunning snowfall totals through Thursday in the high country, including 6½ feet at Kirkwood Mountain Resort and 73 inches at the Donner Summit. The storms boosted the Sierra Nevada snowpack, which was measured at just 70 percent of its historic average on Jan. 2, to a healthy 126 percent on Monday. Squaw Valley Ski Resort said it’s seen more than 10½ feet of snow in January and is on track to shatter a 45-year-old record for January snowfall. Four consecutive days of heavy rain in the valley sparked flood concerns near Sacramento, at the confluence of two of the state’s largest rivers. Mountain and foothill runoff over the weekend swelled the Sacramento River, forcing the State Department of Water Resources to deploy a seldom-used flood control measure. 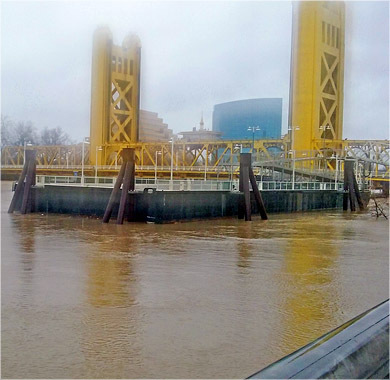 For the first time since 2006, engineers on Tuesday opened up gates on the Sacramento Weir, diverting water to the Yolo Bypass flood plain to keep the river from breaching its banks in downtown Sacramento. The weir is a critical flood control feature for the river and its network of levees, some of which are more than 100 years old. Rain totals jumped to historic levels across many of Northern California’s watersheds by Monday. According to the National Weather Service, Northern California precipitation levels are 203 percent of normal, on pace to top 1982-1983 for the wettest year on record. For perspective, “Northern Sierra eight-station index” averages 50 inches of rain per year, yet already has been doused with 41.9 inches since the rainy season started in October. The index’s monthly average precipitation totals have been eclipsed in three of the four months since the season began, including October, which recorded 420 percent of the station’s historical average. The Northern Sierra eight-station index consists of the watersheds that eventually fill up the state’s vital reservoirs, including Shasta Lake and Lake Oroville. The pineapple express was too strong for an ancient giant sequoia in the Calaveras Big Trees State Park near Angels Camp. The iconic Pioneer Cabin tunnel tree collapsed Sunday as the state park was saturated with nearly 8 inches of rain. The Pioneer Cabin was tunneled at its massive base 137 years ago and at one point cars were allowed to drive through it. “The Pioneer Cabin tree has fallen! This iconic and still living tree – the tunnel tree – enchanted many visitors. The storm was just too much for it,” The Calaveras Big Trees Association wrote in a Facebook post. California’s Wine Country did not escape either. The Russian River in Sonoma County surged over its banks and flooded homes and vineyards. Forecasters warned that the river could surge more than 6 feet above flood stage by Wednesday night and continue to flood neighborhoods in Guerneville. On Tuesday the National Weather Service issued a flood warning, coastal flood advisory, a flash-flood watch and a hazardous weather warning for the Russian River area. Turbulent weather caused officials to close roads heading into Yosemite National Park due to the rain-swollen Merced River overflowing its banks and flooding campgrounds. Though the storms have replenished water levels at many of the Golden State’s reservoirs, 67 percent of the state is still suffering some level of drought, 54 percent of it in severe drought. The United States Drought Monitor’s next California update is scheduled for Thursday.